A Major Shift: Is This Idea Sacrilege? I don't know if I'm pushing hot buttons, or posing a very inappropriate question. I mean it in the highest form of respect. Due to reading yesterday that 1276 tickets were given to homeless persons last year for trespassing, when I saw a friend post this picture today, my brain/heart put two and two together. Would this not make a fabulous homeless shelter for those 1276 that are in need of warmth? Maybe they might even be able to be put to work to finish it. I'm not playing devil's advocate. I'm serious. We have 140+ temples constructed or in the works. Would just one homeless shelter sponsored by our tithes be inappropriate? If you object, please enlighten me as to why. Please use scripture though. Thanks Joshua! 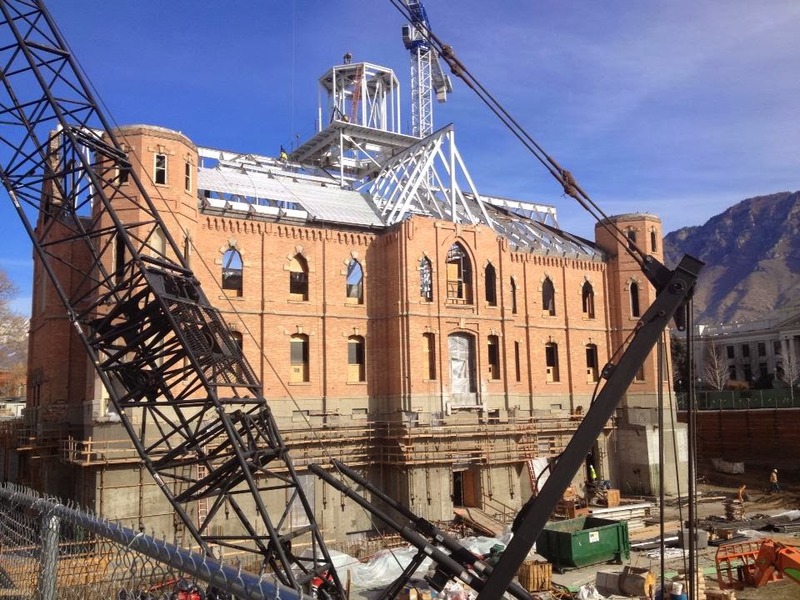 I don't believe the citations were on the construction site - they were said to be in SLC. But yeah, that would spell trouble! :) Thanks for stopping by and commenting! LOL. Maybe if it's created spiritually that way, it will become such with enough time (and enough drooping sales), right? haha! Great idea! Thanks for stopping and commenting! There are lots of LDS sponsored places and programs for people in need. I'm sure if you wanted to know more your Bishop could help you find places. I helped out at a bishop's storehouse like a mile south of this temple-to-be. From my experience, the church does LOTS to help people, mostly behind the scenes. The only flashy buildings we build are temples, it would be kinda weird if we built a flashy homeless shelter. "The only flashy buildings we build are temples"
One, two, three... Let's go shopping! Riley, thanks for the links and thoughts. I always very staunchly believed what we did was sufficient, and while disaster relief and storehouses for members to access are absolutely wonderful, I think it gives the impression that as long as we fill out our little white slips, our job is done. If we can invest millions into temples and have resources to create such masterpieces, and resources from tithing interest to build malls, bookstores, etc., I don't see why this is such a hard task. The first paragraph under the "basics" on the first link is exactly the point. "As disciples of Jesus Christ, members of the Church of Jesus Christ of Latter-day Saints strive to follow the Savior's admonition to feed the hungry, give drink to the thirsty, take in the stranger, clothe the naked, and visit the sick and those in prison (Matt. 25:35-36)." I appreciate your loyalty - I am loyal as well, but I think much like some of the previous social issues this church has faced, our voice and loving concern will be what draws more attention. I think the Lord has already made his opinion clear about it, and we've been pretty slothful. Thanks for your comment and stopping by! Yana - LOL! Precisely! Thanks for your comment and stopping by! Does the Church have to do everything for us? Building a temple requires priesthood authorization, so the Church kind of needs to do that. Caring for the homeless, not so much. Why can't we just do it? What if we took them in ourselves, cared for them individually, and helped them with the things they need to get back on their feet (or to get on their feet for the first time in their lives)? Helping the needy is one of the 4 missions of the Church, and it's an important one, but it's really not more important than the other 3. What if the Church could spend time and money on temples and we simultaneously spent our time and money on the needy? I don't think it needs to be one or the other, especially if we're not waiting for the Church to take care of things we are capable of doing ourselves. Taking care of them on our own is pretty much the only option we have as members, unless they're a member too, and we can then pull from fast offering resources by forwarding them to the bishop. That's the point - it's all on our shoulders, when it's dictated to be otherwise http://www.amajorshift.com/2013/11/jst-gen-14.html I have not mastered all scriptures, but JST Gen 14:35-39 is pretty clear about what is to be done with tithes. And Bishops storehouses, to my knowledge, only service members, but I may be wrong. Happy Thanksgiving Dean! Thanks for the comment and stopping by.